Islands around the world are special places for many reasons. With their unique floral and faunal compositions, and a high degree of endemism in species, they are live laboratories to watch evolution in action. The Andaman and Nicobar Islands are no exception. They have a wealth of wildlife that is largely unexplored, not unlike parts of the vast coastline of mainland India. The rocky and sandy inter-tidal coasts, mangroves, coral reefs, and deep sea harbour multiple habitats for unusual creatures, all fascinating and beautiful. These habitats interact intimately with their organisms and are intricately connected with each other, frequently with cascading effects and unforeseen consequences on associated life. A walk on the beach is a lesson on life and adaptation. The mangroves are amphitheatres for waders, juvenile fish, and marine invertebrates, alike. 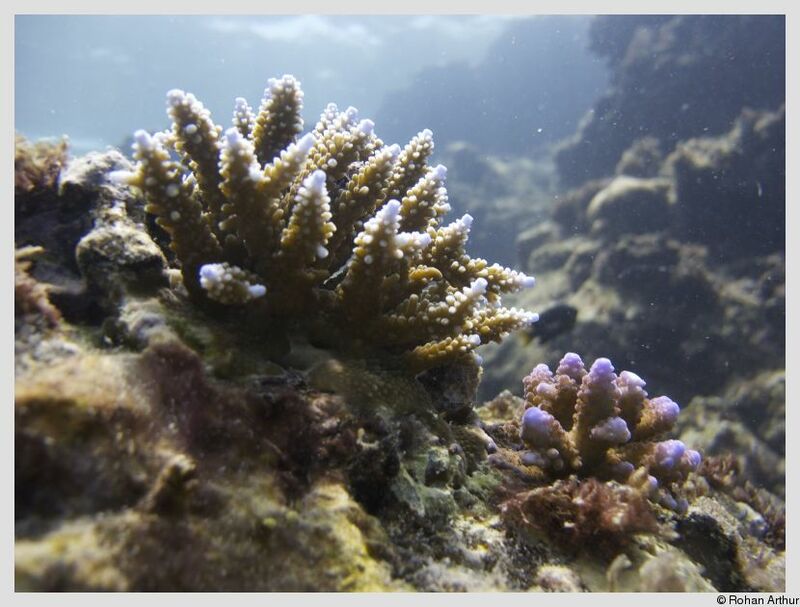 The coral reefs are odes to diversity and complexity, and lessons on the fragility and interactivity of systems. The deep sea holds secrets and mysteries unsolved, as one ventures farther from the seashore. "Cheap thrills", as Quammen puts it, include the dolphins and dugongs, sharks and rays, tropical fish and marine invertebrates. This is an attempt to recollect some experiences from the islands, and hopefully introduce the uninitiated to some of these habitats and their creatures great and small. All is still. For a second. And then some. One cannot say when it will be still again. One cannot predict for how long it will last. None can tame the tide, it is said. Maybe, maybe not. One cannot say; I know that arguing with the tide is an exercise in futility. But some adapt to it, evolve around it, spend a lifetime enduring it. As they say, there is no ignoring the tide. For long, anyway. One walk is all it takes. To be intrigued and enchanted. To start stalking the tiny nomads of the coast. To set up a scope and watch migrant waders, year after year. To seek out unusual shells. Cockles and clams. Conches and oysters. Tread slowly and carefully, and barefoot. Oh, please be barefoot. Feel the sand crunch under your feet, a small bucket in hand, and all eyes on the ocean foam appearing with a swish and noisily receding. All senses awake, enjoy the blue crabs dance to the fiddlers' tune. Oh, did you see that piece of rock lolling about with the waves? Do pick it up. The numerous pieces of rock and coral strewn on the beach are full of life. A live laboratory to learn from, if you will. Do you see that the mass is encrusted with barnacles and limpets of all sorts? One fist-sized lump so full of life, you will never see anywhere else. Flat worms and borers. Snails and foramniferans. Tiny invertebrates and micro-organisms. I doubt if a rotting log in a rainforest can compete with this lump! Writes EHA of the crab in his book 'A Naturalist on the Prowl', "He is, I think, the noblest of his race. Living on the open champaign of the white sea-shore, he learns to trust for safety to the keenness of his sight and the fleetness of his limbs." His characteristic style and wit intact, he adds, "But, keen as is his sight and amazing as is his speed, he more than needs it all; for alas! he is very tasty and all the world knows it." Time seems to have stood still for some of the world's creatures, for this rings true for crabs, many shellfish, and a plethora of their marine brethren today, as it did in EHA's time. The diversity and richness of marine life is staggering. Let us pick up some coral, rocks, and sponges - something small that gets washed ashore. Be responsible, that is earth in miniature that you are carrying with you in a bucket of water. Try carrying a specimen the size of a football back to your microscope or look through a magnifying glass and you will know the pain of a crumbling chunk that is filled to the brim with life. Tens of species, of myriad hues, mystifying shapes, and sizes great and small, all within that piece of earth you are holding in your hands, begging to be observed under a microscope. There is anticipation in the air. One can thoroughly enjoy picking the organisms out carefully and making slides. The joy of the mundane? Or maybe a labor of love? They look even more magnificent under the lens! Always collect those that are dead, or discarded - shells, crab molts, and such. Try not to go overboard in your enthusiasm, and rather than throw them in the garbage after observation, return them to the sea, if possible. If the organisms are alive then keep them in sea water, after bringing them in a bucket or container of sea water. We can make slides of the dead specimens and use petridishes with salt water for those alive. One feels alive and astonished by the sheer diversity of life on earth and underwater. On each walk, one is guaranteed a treasure-trove of shells of all shapes and sizes - conches, clams, oysters, cockles. On an average beach in the Andamans, one can see shoals of juvenile fish, sea dollars, shrimp, crabs, brittle stars, lobsters, adult fish, sea cucumbers, sea stars and even interactions therein, such as the bizarre gobi-shrimp mutualism. The Andaman and Nicobar islands Environmental Team (ANET) field station at Wandoor in the South Andamans is paradise for researchers and naturalists. A stone's throw from the ANET fieldstation is a pretty little beach that is perfect for exploratory jaunts and romantic strolls alike. On a walk here, I saw my first shark. A shovelnose guitar-shark, it turned out to be. Part ray, part shark, it was the right mix of mystery and intrigue to get one interested! 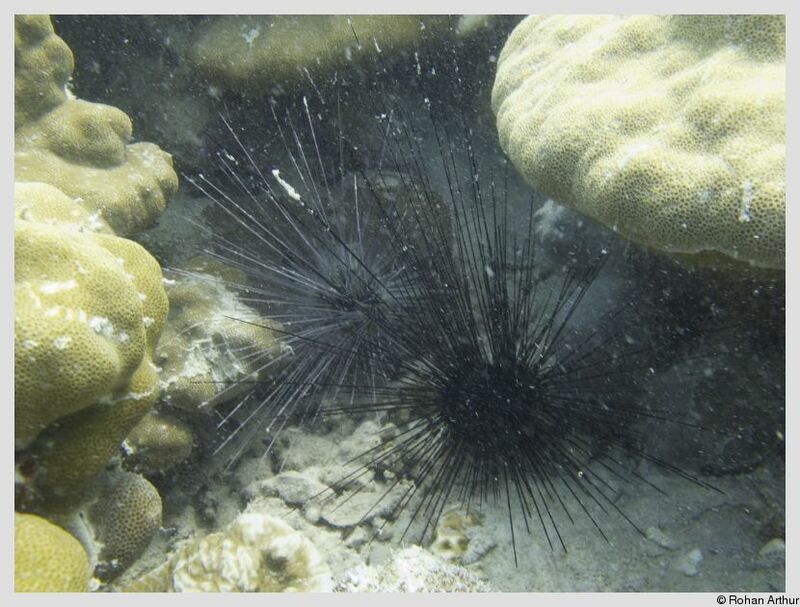 The researcher accompanying our small student group commented, "That is the marine equivalent of seeing a tiger!" Soon there were yells from every direction and after seeing two dozen guitar sharks, we were not so sure about the comparison! A special spotting nonetheless. The excitement of watching a starfish upright itself is a truly mesmerising sight. An exercise in yoga? A lesson on calisthenics by a gymnast? Both. Neither. It may be a rarity on the inter-tidal zones of the mainland, but is a guarantee on the islands. 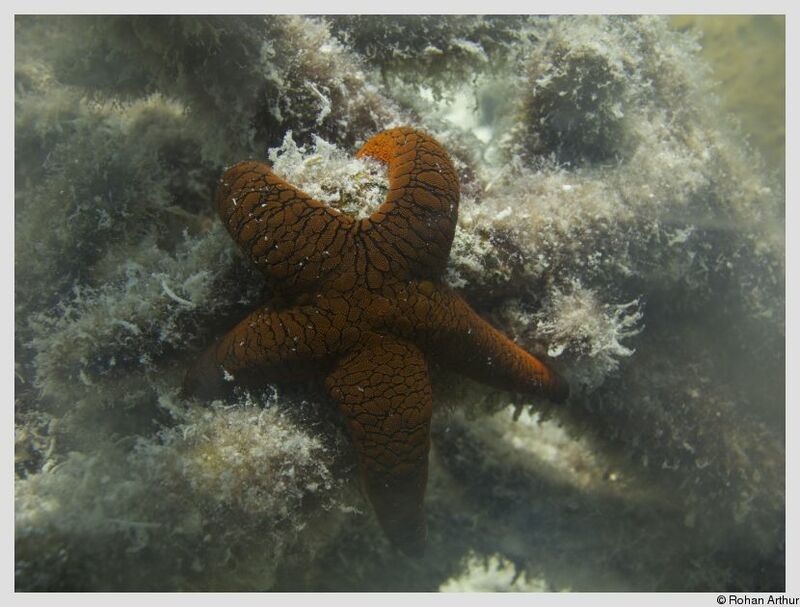 It should be a part of the tourism slogan for Andamans - "Be as fit, sun-kissed, and supple as the sea star. Visit India's island star!" Or something just as cheesy. To see an octopus is a delightful and yet meditative moment. And, to think one could see one standing knee-deep in the beach is surprisingly easy. All it needs is patience and watchful eyes, I suppose. The first thing I did was to try and count the tentacles. So obvious and unnecessary, but invariably what happens. From the intertide and the beach, one progresses a little. 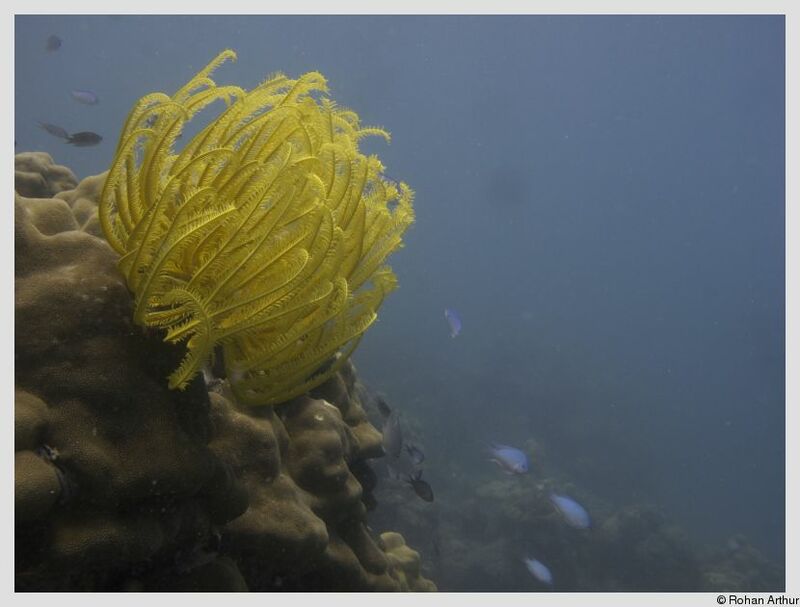 Borrow some snorkelling gear and discover a whole new world amidst the coral reefs. Metres away from the shore on many of the numerous islands of the Andamans, one can follow brightly colored and spectacularly beautiful fish. Watch the ubiquitous butterflyfish, or follow some parrotfish. Wait as some sweetlips pass by. Ogle in rapt fascination at the cleaner wrasses busy at work in their cleaning stations. We progress some more. 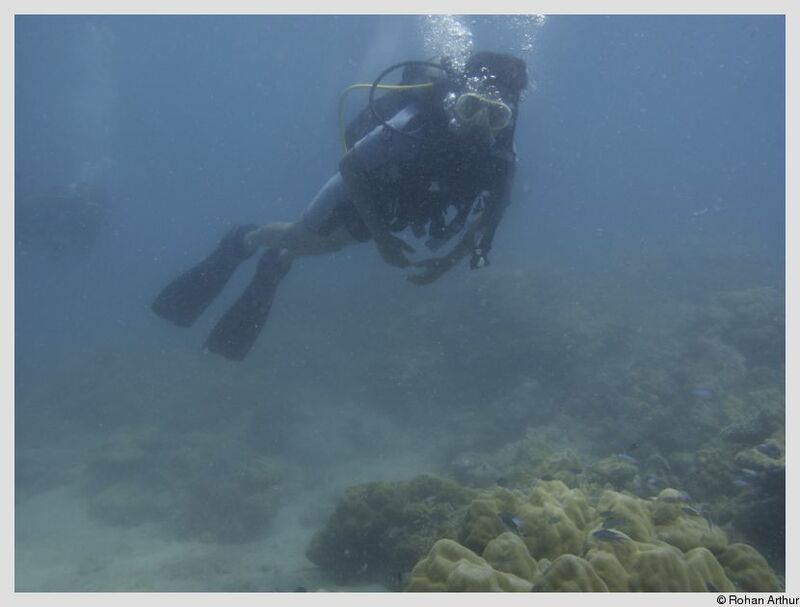 You have seen nothing yet, if you have never been scuba diving. The first dive may be nerve-wracking but one is guaranteed addiction after three dives anywhere in the world. One fine day during our stay on the islands, we visited this quaint dive site in the Indian Ocean called Allen's Patch. It has some lovely reefs, a nice sand bed, and a wonderful assortment of organisms. The sea was very calm. Too calm for comfort. A lull before the storm. Still and clear like a mirror, occasionally turning into clear glass through which we could see a little under the water. We could see storm clouds ominously looming over the islands. There was adventure in the air, mingling with the salty breeze. We set off into the ocean in a local boat made in the style of a canoe of sorts called a 'dunghi'. The dunghis are typically made from a single piece of wood, usually something called Mahua or bullet wood. It is very hardy and is not usually affected by shipworms or borers which damage wood - ideal for the conditions here. Our dunghi was named 'Thi So Pa' meaning 'Emperor of the Water' in the Karen language, which is spoken by the Karen community who are people of Burmese descent in these islands. ... is worth a dozen at sea! The day's first special sighting was a little before we reached the site - a sting ray. Just a brief glimpse, a ruffle on the surface breaking the still, somewhat ponderous water. It is always welcome to spot some black-naped terns, especially where one would least expect them. Oh, there goes one with fish in its mouth! And, did you see the needle fish that keep shooting out of water, flashes of quicksilver against a sapphire background. 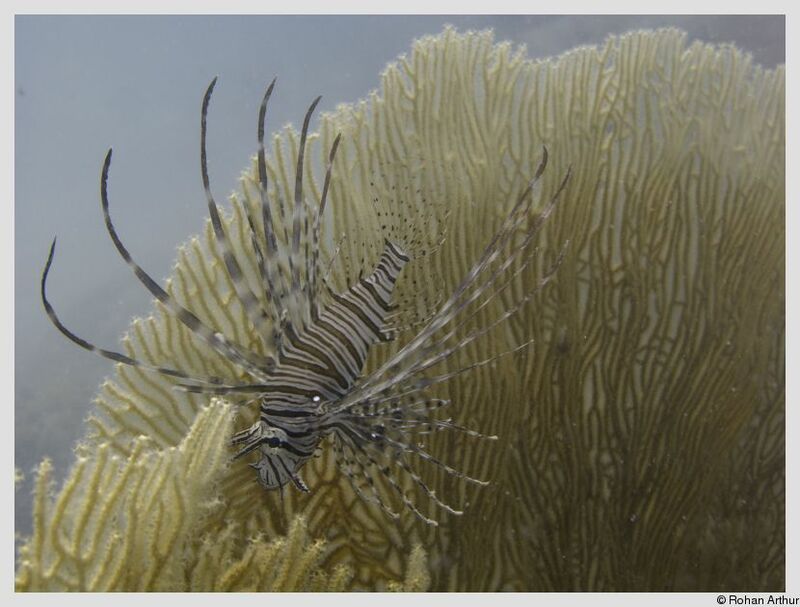 It is almost impossible to describe the diversity of life seen when diving, especially in the tropics. Ah, the thrill of seeing a school of squid! To see a single squid is quite rare; imagine seeing 50-60 small squid. If one manages to get a squid in a container, it is sacrilege to do anything but watch in rapt fascination. Each outing to a dive site is accompanied by the possibility of spotting some dolphins, from the boat and when in the water. Or a marine turtle during a dive. There are four species of marine turtles that can be found in these islands and their surrounding waters: the olive ridley, hawksbill, leatherback and green. An encounter with a turtle when diving, either when peeping into some crevice or seeing one swim up gently to the sunlight-dappled surface, is mesmerizing. The soft nonchalance of the turtle swimming past, a school of multi-colored fish in the aquamarine background, in the interplay of light is awe-inspiring. All our senses come alive when diving. 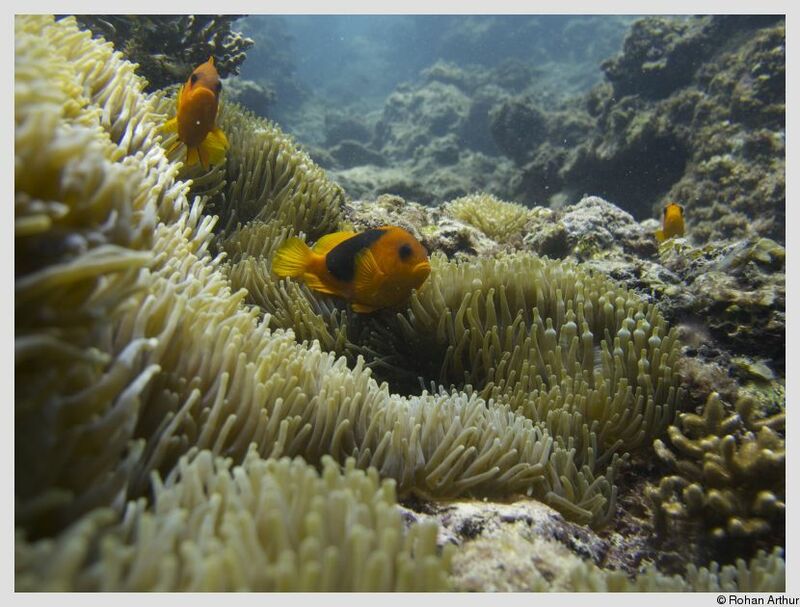 The oranges and yellow of the clownfish weaving in and out of the varied browns of the anemone. The explosion of blues, yellows, and whites when the butterflyfish hang suspended in the water. The multi-colored and iridiscent pinks, purples, and cyan of the parrotfish. The dull but diverse surgeons and groupers, pufferfish and boxfish. 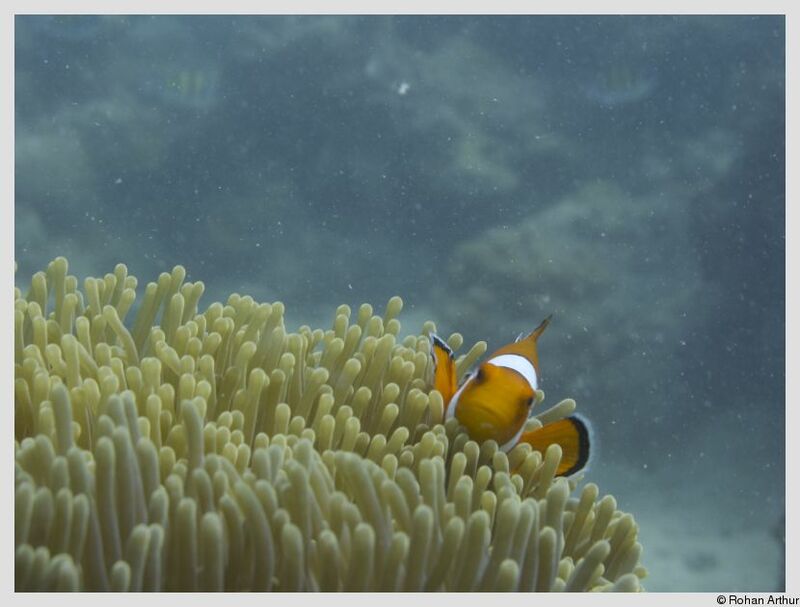 The riot of colors of the corals and anemones, the tropical fish and the eels, the squid and jellyfish. The spectacularly colored giant clams and starfish. The vivid colors are eye-popping and one does not know where to look. The strange dull sounds notwithstanding, it is usually quiet. A loud and chaotic silence when surrounded by life, and a calm lull when not. The feeling of being suspended, the ability to move up and down with just one's breathing, all bring a sense of liberation and freedom unlike anything else. Skin diving is my favorite lesson from the islands. What is that, you ask? The ability to dive into the ocean with a single breath, either with or without a snorkel, and then surface again. The first time I saw someone skin diving, up close and personal, he just dived suddenly and brought up a perfect spider conch - it was alive and gorgeous! That experience was enough for me to learn and practice. It feels surreal, somehow. More intimate. Liberating. No strings attached. Nature raw but sublime. Never try this without supervision but it is simple once understood, and worth the effort. It becomes second nature with some practice. 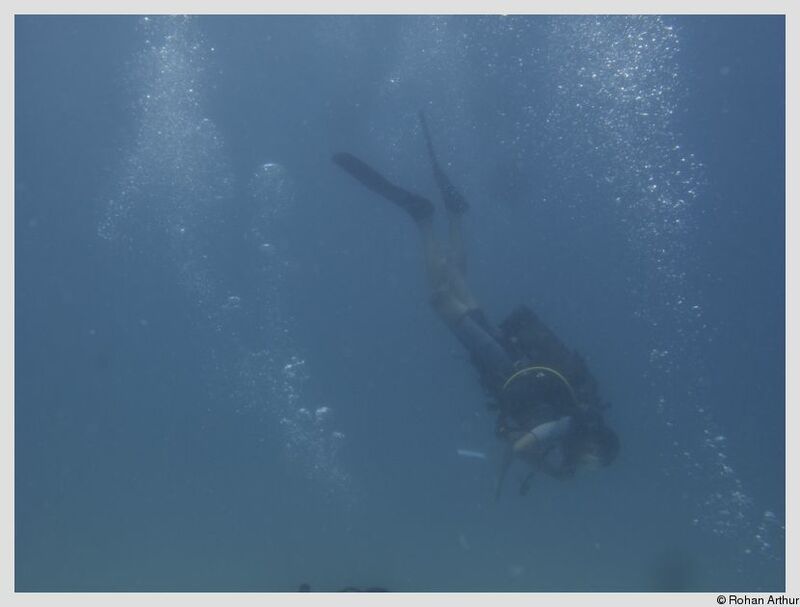 One basically hyperventilates a bit, takes a deep breath with the snorkeling gear usually, and dives head down and pushing the feet up. This is the hard part. The lungs are full of air and tend to make the person rise. There is initial resistance, but once you clear that, you can go as deep as you can. It just depends on how long you can hold your breath. And once you feel you are running out of breath, you just start rising to the surface. You will have to keep equalizing to clear your ears, as in scuba diving, and on surfacing clear the snorkel of water with a powerful blow into it. This can also be done without the snorkel. When snorkeling if one wants a closer look at something a little deeper and just dives quickly to explore or check objects out, this is a neat skill to pick up. And, that was how I encountered my first stonefish - an unattractive, superbly camouflaged species that is thought to be the most venomous fish in the world. A lesson in avoiding touching creatures - do not touch, if you can help it! Sea cucumbers and sea urchins, sea slugs and starfish, an assortment of echinoderms, molluscs, and crustaceans abound the coral reefs of the Andamans. And one must not forget all the other marine invertebrates! Oh, the sheer diversity of corals and anemones and jellyfish ... Sea whips and sea fans, sea feathers and sea pansies, stony corals and branching corals. The diversity is staggering, and spellbinding. From the ocean, we return to the seashore. To the mangroves to be precise. An area that is more adapted to the tide, overflowing with life evolved to deal with the dynamics of the flow, one would be hardpressed to find. The mangroves behind the ANET fieldstation in the Andamans are a lesson in change, and in adaptation. A scintillating outdoor classroom and laboratory for studying evolution in action. The propagules of the different mangrove species are a fascinating lot, bobbing about in the shallow waters. The complex aerial root systems, called pneumatophores, are so well suited to life with the tide. They are dangerous things, these superb roots, one realizes quickly, wading through waist-deep and murky water in the same area that was soft and gooey a few hours ago. With the poor visibility, all one is left with are painful pricks in the feet from the pointy roots. The feeling of sinking feet in the clayey soil is therapeutic. Did you notice that faintly foul smell? Watch your step! Some patches have deeply compacted decomposed matter that when disturbed raises a stink. The difference between high tide and low tide is stark in a mangrove. One hears the call of the mangrove whistler. And sees a crake or rail dash into the reeds. This is wader heaven and a birder's paradise. Islands around the world have really high endemism and the Andaman islands are no exception. Exploring the mangrove makes it an instant open-air classroom. And amphitheatre. The hermit crabs are gladiators navigating intricate mazes in a hurry, while the snails take it slow. Have you seen a crab feed? Have you seen tiny trails of sand pearls, like a delicate necklace, on the beach? Have you seen the crabs scuttle in and out of their burrow homes, playing hide-and-seek with the waves? A walk on the beach from twilight to midnight introduces us to a whole new dimension of life. Every piece of log, frequently bulletwood in the Andamans, is home to creatures great and small. Come night and the reptilian visitors make their appearance on the seashore. The most venomous snakes on earth have a history of almost never biting humans! The beach is taken over by sea kraits, their alternating bands of black and white remind us of prison uniforms of yore. There are two species common in the Andamans, the yellow-lipped sea krait and the blue-lipped sea krait. Both can be found hidden in convoluted pieces of wood or slithering between the sea and the sand. Close to midnight, one may be lucky to come by some nesting turtles. If the time is right, as the wise say. Back on the mainland, whether one is in Chennai or Mumbai, on the east coast or the west, there is always wildlife right in the backyard. A walk in the garden, beach, or creek is all it takes. However, there are issues aplenty. Marine creatures are sometimes ignored as wildlife, and unsustainable seafood consumption has affected many of the world's seas. Marine systems are impacted on all fronts - from climate change, pollution, fishing, sedimentation and whatnot. The scene on the islands is not far off, fragile ecosystems that they are. There were notorious times when roads in the Andamans used to be lined with shark-fins that were exported to other countries in south-east Asia. Thankfully, this seems to be on the decline these days. Although, even today, a visit to the fish-landing jetty is gloomy and the air heavy with death. Moray eels, long and small, and fish of various sizes, dead and washed ashore, grotesque with open mouths and glassy eyes gaze back at you lifelessly. Thankfully, the tide is changing. Awareness is on the increase, and sustainability seems to be catching on. There is hope still in paradise. Everything starts with a walk on the beach. It all adds up, lessons and questions, chaos and peace, life and death. The answers come to you. One step at a time. One breath at a time. A variant of this was shortlisted as a finalist for the M.Krishnan Memorial Nature Writing Award - 2014, but did not win.